The Hawkesbury region boasts beautiful world heritage locations, majestic rivers and more national parks than any other part of Sydney. The Hawkesbury is cradled by four gigantic parks - the Blue Mountains National Park to the west, Yengo and Dharug National Parks to the north and the mighty Wollemi National Park to the north-west. Many people head straight up to the Blue Mountains to go hiking but we think the bushwalks around here are just as good! 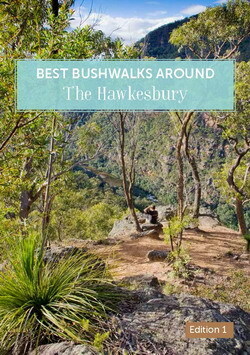 If you want to plan a walk grab a copy of the Best Bushwalks Around the Hawkesbury (available from the Hawkesbury Visitor Information Centre and the Hawkesbury Regional Museum). At only $6 this very popular guide details all you need to know to make your day in the bush memorable. Many areas are covered including the Colo River, Wisemans Ferry, Bowen Mountain, Grose Vale and Mount Wilson. If you are interested in bushwalking in the Hawkesbury area the Visitor Information Centre has a handy $6 guide which details 12 of the Hawkesbury's best bushwalks. This extremely popular guide has something for everyone. All of the bushwalks are about an hour's drive from Richmond. There is something in the guide for novice bushwalkers as well as more experienced walkers. Available at the Hawkesbury Visitor Information Centre, 328 Hawkesbury Valley Way, Richmond NSW 2753. Phone 02 4560 4620.